The ultimate guide to Ruka ski holidays in 2019 & 2020. As well as a modern ski area catering for beginners, intermediates and freestylers, this fairytale Finnish resort has miles upon miles of cross-country trails and a whole host of activities like husky sledding and reindeer safaris. If this wasn’t enough, Santa lives down the road and the chance to see the mystical Northern Lights completes the package! Nestled in the Finnish hills on the borders of Lapland, just south of the Arctic Circle, a visit here is a once-in-a-lifetime experience (and many return again and again). 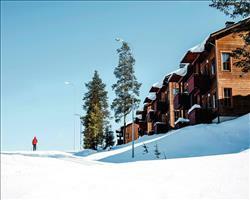 Sometimes called the ‘gateway to Lapland’, the resort was founded in the winter of 1954 when the first slope opened. Since then it’s flourished, winning ‘Finnish Ski Resort of the Year’ at the 2013 World Ski Awards - there are now 34 groomed runs and over 500km of cross country trails. Most packages have flights that go via Helsinki and land at Kuusamo Airport. From here it’s an easy 30 minute road transfer to the resort, which is small and family-oriented, with a friendly community feel to it. Centred on the traffic-free pedestrian village, it’s made up mainly of modern hotels, restaurants and shops, with a 320-space heated underground car park below. To those used to skiing in France or Austria, Finland offers a completely new experience with much more of an untouched, wilderness feeling. Finnish resorts tend to be situated at lower altitudes – Ruka is 291 metres above sea level, with the high point being 492 metres. Don’t be fooled by the numbers, though – even at this altitude it is one of the most snow sure resorts in the world. Thanks to its extreme position just below the Arctic Circle, the temperature this far North rarely climbs above 0°C all winter, preserving snow excellently through the season. The season is long, too - often running from October to May with certain slopes sometimes kept running artificially until June! Whilst the downhill ski area may be smaller than some resorts, this is more than made up for by bucket loads of other activities on offer like husky sledding, snowmobiling, ice fishing, reindeer herding and truly world class cross country skiing. If you’re lucky, you may even get to see the famous Northern Lights in all their glory. View our detailed Ruka snow forecast or snow report and see all live webcams, piste maps, road and travel maps and lift pass prices. For a picture of historic snow conditions see the snow depths month by month with our Ruka snow history. Whilst larger resorts can be a bit overwhelming, the compact, unintimidating ski area here is just right for first timers. Many of the lifts are beginner-friendly t-bars and Ruka also boasts the largest and oldest ski school in Finland. 41% of the runs are suitable for beginners – including the longest at 1.3km (blue 27 on the piste map). We also like number 7, which is a confidence boosting green that takes you back to the village. Intermediates are just as well catered for with 43% of slopes classified red. Vuoselli has numerous long, cruising blues and reds all accessible from a high-speed covered chairlift and Masto’s reds have campfires at the bottom where you can warm up before the next challenge. Freestylers will feel right at home – the FIS Freestyle World Ski Championships took place here in 2005. There are two snow parks with a range of kickers, tabletops, boxes and rails, an FIS standard superpipe, a boardercross course and a freestyle mogul run. Finland is world renowned for its cross-country skiing and there are a staggering 500km of trails in the area, over 50km of which are floodlit at night. 87% of the main slopes are floodlit too and all are open until 7pm daily, so there’s no need to be up at the crack of dawn to make the most of your day on the fell. 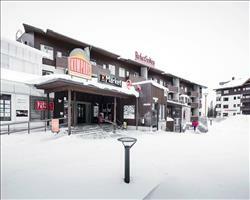 Ruka’s well known in Finland for its vibrant and friendly après ski, with a number of bars, pubs and restaurants to suit all tastes. We love Chalet Ruka Peak where you can sip on cocktails and sample refined dishes in a smart, cosy lounge with stunning arctic views. If you’re feeling adventurous, don’t miss the Riipinen Wild Game Restaurant where reindeer, elk, bear and arctic fish are nearly always on the menu. The aptly named Classic Pizza Ruka has a friendly, informal setting. The Kontioluola bar regularly hosts live bands, and club Tellu Night sees DJs playing into the early hours. If you’re looking for exciting winter activities besides skiing, you’ll be spoilt for choice. Venture out after dark and you even stand a chance of glimpsing the incredible northern lights. This awesome natural event lights up the sky with luminous greens, blues and reds, a once-in-a-lifetime experience. There are over 600km of snowmobile routes and ‘snowmobile safaris’ of varying lengths can take you deep into the forests. If you fancy a more traditional method of travel, two popular choices are reindeer and husky safaris. Starting from private farms, these excursions are also a great chance to learn a little about a historic way of life and try your hands at reindeer herding or husky harnessing. Other activities on offer include ice fishing, snowshoeing, ice kart racing, bowling and even an Angry Birds activity park! Those looking to relax and unwind will find a number of saunas and a masseur in the village shopping centre. There’s also a recently opened day spa that can be reached on skis or by foot, offering a range of the usual treatments as well as traditional Lappish stone and berry options. 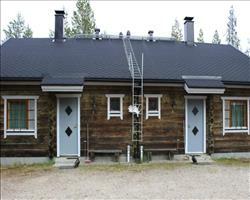 A little further afield in Kuusamo town there’s even a tropical swimming pool complex! Of course, you can’t come all the way to Lapland without paying a visit to Saint Nick – especially if you have little ones in tow! Luckily, as he lives so close, there are plenty of opportunities to meet Santa. Take a guided tour into the forest to search for Santa’s cottage, where kids will be greeted with warm drinks and presents before hearing stories about the elves and Rudolf from Santa himself. When is the best time to ski Ruka? 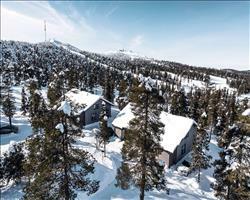 Ruka makes a great skiing destination all season long. Late season snow is historically very good, while sub zero temperatures and snowmaking on every slope keeps things going nicely well into May – sometimes even June! This resort is less well-known than many other European resorts, such as those in the Alps, which means the slopes rarely get overly crowded even in peak weeks. Even if there are lots of visitors, the lifts are able to carry 25,400 skiers an hour to make light work of queues. If you want the ultimate winter wonderland experience, Christmas is the time to come. The resort puts a great deal of effort into celebrating and the atmosphere is magical! If you’re hoping to see the Northern Lights, these are most common from December to late February. Don’t let that put you off if you can only make it in March or April, though – they can appear at any time and this is one of the best places in the world to see them. 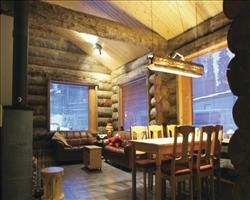 For families with children, Ruka is simply an amazing place to be. For starters, the village itself is completely traffic free – a big plus for anyone with young, excitable kids! Kids under 6 traditionally ski for free (provided they wear helmets), and the compact nature of the resort and ski area makes it easy for parents to drop kids off at ski school and pick them up afterwards. After ski school, parents can take the little ones over to the dedicated children’s zone in the Vuosseli area, where there are 3 gentle magic carpet lifts, to practice what they’ve learnt. Kids can go sledging or tobogganing here, too. Vuosseli is also where you’ll find the Rosa & Rudolf activity park, offering the chance to ski alongside herds of reindeer and even through the middle of a mountainside house. Once they’ve picked up the basics, the gentle blue runs found all around the fell are the perfect stage for the kids to show off their new skills. For more adventurous children and teenagers, there are two terrain parks where they can practice the art of getting air! One of the best things about coming to Finland with kids is the huge number of activities available off the slopes. Husky sledding and reindeer safaris are bound to be an instant hit, with many outings including the opportunity to meet the animals first and even help with herding and harnessing. There are also indoor activities available for little ones who want to escape the cold, including swimming, bowling and even an Angry Birds activity park! For children too young to ski with their parents, the Happy Family kindergarten and indoor activity centre will ensure they remain amused and well looked-after during the day. Teens can chill out, play table football and cure any Facebook withdrawal at the Reili Cafe, which is specifically aimed at young people and is open in high season. If you’re bringing the kids skiing, you’ll obviously want a resort that holds up during the school holiday periods. Luckily, whilst other more well-known resorts can get overcrowded, school holidays are arguably the best times to visit Ruka. The slopes tend to remain quiet and safe even during the busiest peak weeks and long lift queues are rare – especially during the week. Christmas and New Year are bound to be magical, with Christmas lights, firework displays and reindeer. Santa lives just down the road, too and it may even be possible to arrange a one-to-one meeting! Ruka is ideal for a group ski holiday, with plenty to please beginners and intermediates alike, as well as an incredible range of activities for non-skiers. As far as downhill skiing goes, this resort is perfect for a mixed group of beginners and intermediates with its ski area made up mostly of cruisey reds and blues. The Vuosseli and Masto areas are particular highlights. Experts aren’t left out either, with a number of more challenging red and blacks as well as loads of freestyle options. The compact nature of the ski area is great for groups who want to split up and ski different runs for part of the day, then easily meet up for lunch or ski together in the afternoon. There is a whole host of other activities for non-skiers or those who just fancy something different! Highlights include reindeer, husky and snowmobile safaris that can see you venturing deep into areas of pristine untouched wilderness, by day or night. Competitive types can pit themselves against one another in an adrenaline-fuelled ice karting race, whilst group members looking for something more chilled out can try their hands at ice fishing or snowshoeing, or even book in for a spa treatment. Of course there’s usually at least one shopaholic in the group and they’ll be well catered for too – there’s a shopping centre that usually sells big name brands as well as local Finnish products! Après ski isn’t as wild here as in some larger resorts, but there are still plenty of options. For a casual drink with chilled out music and amazing views, get yourself to the bar at Chalet Ruka Peak. Those who fancy something a bit wilder should head to Tellu Night, a club that regularly hosts live DJs until 4am. 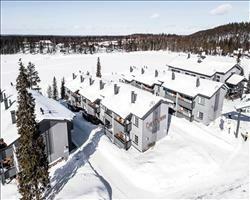 The majority of our accommodation in Ruka is in apartments – perfect for groups as this is one of the cheapest and most flexible ways of skiing. Working around fussy eaters isn’t a problem as you cater for yourselves. You also have the option of checking out local restaurants such as the Riipinen Wild Game Restaurant, where you might be lucky enough to sample elk or even bear! 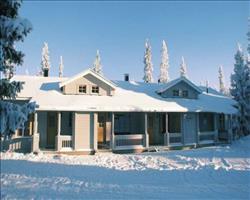 We also have some great hotels in the centre of Ruka – a super option for larger groups, especially if there are stragglers who may want to book at a later date. "Ideal for families and beginners"
The slopes are nice and wide. If you’re a beginner, the skiing is absolutely perfect in the fact that you’re not worrying that you’re going to be knocked over so your confidence can grow really quickly. I don’t know about other times of year but the slopes weren’t busy at all when we were there. They don’t really have as much for advanced skiers but for kids and beginners it’s fantastic. It was really cold (-15C) so we could only do a few runs and then we had to come in. There’s a nice log fire in the restaurant at the bottom of the slopes where we could stop off for hot chocolate and at the end of other slopes, they had fire pits which you could sit round to warm up. It does get dark quite early but this didn’t bother us as when you ski with kids you don’t tend to ski the whole day anyway. We went here about 6 years ago when the kids were younger and did the reindeer and Santa Claus thing. If you have young children it’s absolutely ideal, our friends took their children to one of the Santa parks but Ruka was much nicer as they only have a maximum of 12 kids at a time and the children can meet him in a log cabin. In terms of accommodation, if you have small children, the log cabins are a lovely setting but they’re also quite a walk and you have to get a bus. 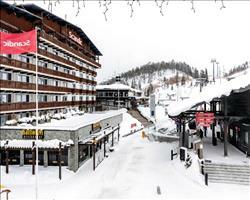 We stayed in the Ruka suites this time round which are more central and getting around was really easy. Ruka is a bit flat to be honest. There aren’t really any big mountains there. It’s good for beginners for this reason. There aren’t many testing runs. You would get a bit bored as an advanced skier, we ended up doing the same runs over and over. There are a few other bits and bobs to do like the Reindeer experience, or the northern lights, and there are snow mobiles just round the corner from the Village Inn Apartments. 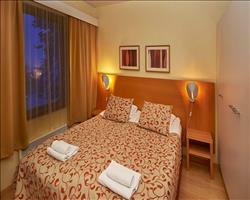 We just skied the whole time, and in the evenings we were knackered from skiing so we just chilled in our rooms. There’s a snowboard park which we went to a bit, there are some good jumps and a half pipe. 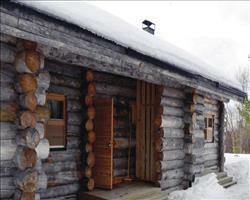 It’s a nice place but I wouldn’t go back because the skiing is limited and it was so cold and get dark early. I’ve been to France and Austria and Italy, I think I prefer Söll which is similar in terms of cost and a fun place. France is definitely more expensive.